Motorized electric scooters are the latest trend in urban mobility. Commuters, students, sightseers, and other riders can enjoy the ease and convenience of renting these nifty motor-powered skateboards with handles. However, with their rise in popularity, there have been alarming reports of serious accidents, injuries, and even deaths involving e-scooters. Some cities have labeled these scooters as a “public nuisance,” or banned them altogether. Currently, they are illegal in New York, although legislation has been proposed to change that. If you have been injured by of these scooters, or by riding or being hit by one, it is important to understand your legal rights and options. You may be able to receive compensation for the injuries, damages, and losses you have sustained. Find out more by reading this online guide, or click here to access a printable version of this guide. E-scooters, or electric scooters, are motorized versions of kick scooters, which have been around for a century. Kids used to make them by affixing roller-skate wheels to a board, and attaching a crate to the front with handlebars at the top. Riders propelled it forward by kicking the pavement. In the 90s, Razor came out with a foldable aluminum version you could keep in your backpack. Today’s battery-powered scooters aren’t foldable, but they’re almost as convenient. Once you locate one, you can rent it by the minute, and if “dockless,” you can leave it anywhere. This concept originated in China, where park-anywhere bike companies are popular. 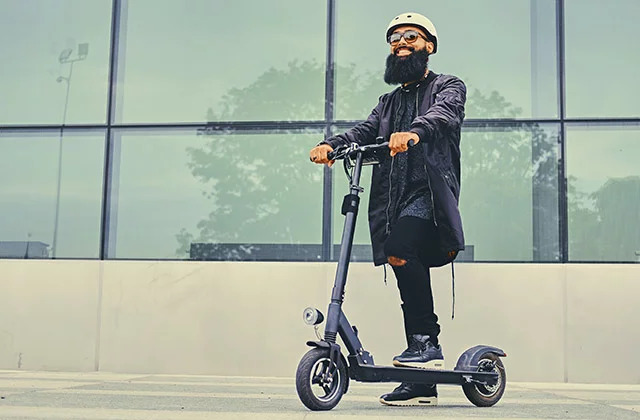 While battery-powered scooters have been available for a while, they recently became equipped with wireless connectivity and GPS trackers. Download the app onto your smartphone or tablet device, like Uber or Lyft. Log in with your email and create a username and password. Agree to a pages-long disclaimer in exceedingly small print absolving the company of all responsibility for damages that may occur while you are using their product/service. Use the app to find the closest available e-scooter; you can also see the battery charge levels of each available scooter. Unlock the scooter by tapping a button on your phone. Leave it anywhere when you’re done. The scooter company’s representatives locate them using GPS technology, pick them up for recharging and maintenance, and put them back on the street the next day. Most e-scooters have a range of about 15 miles or more. 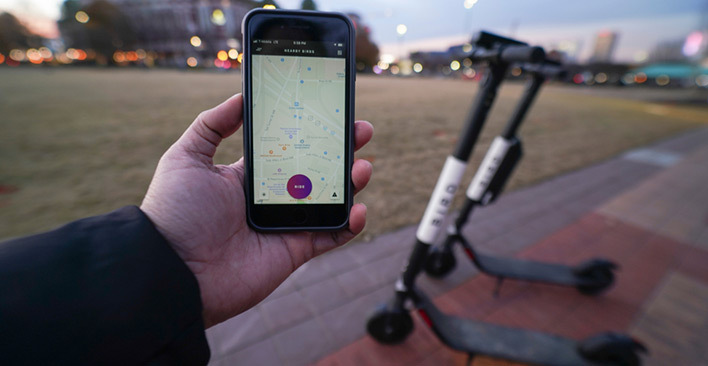 Although prices vary, most scooter rentals start with a $1-$2 flat fee, and then charge a low fee for every minute of use; Bird, one of the leading e-scooter companies, charges $0.15/minute. So, they’re quite affordable. They’re also quite lucrative. Bird, founded by Travis VanderZanden, a former Uber and Lyft executive, gathered a value of $2 billion less than a year after its startup. Other successful e-scooter companies include Lime and Spin. In March 2018, these services began rolling out e-scooter rentals in downtown San Francisco over the course of a few weeks. 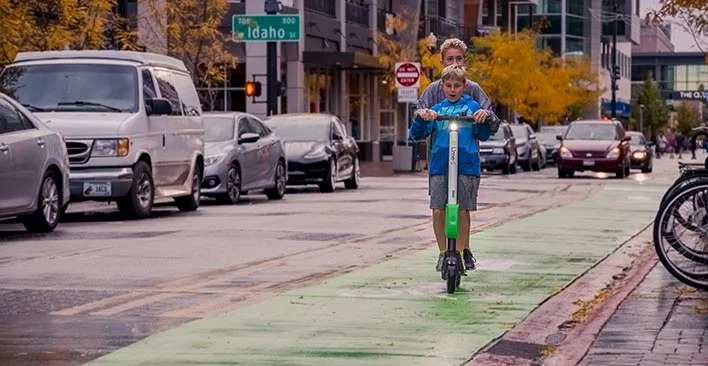 Since then, e-scooters have grown to be ubiquitous across the country, especially in towns with heavy tourist traffic such as Los Angeles and Nashville. Currently, you can find e-scooters in most major U.S. cities and on many university campuses. Many areas require scooter users to have a valid driver’s license, and wear a helmet, although this varies, depending on your city and state. Because they can travel to speeds of up to 35 miles per hour, users should wear helmets and have some training in operating a vehicle. Click here to access a printable version of this guide. Although electric scooters are popular, they are also increasingly controversial. The business model of these e-scooter companies seems to be to (1) dump hundreds of them on city streets, regardless of local requirements and without notifying local governments or police, and (2) absolve themselves of all responsibility for bad behavior by users. Because the electric motor gives riders instant acceleration and torque, they have the potential to cause serious accidents, endangering not only the scooter operator but also pedestrians and bicyclists. A Consumer Reports investigation has revealed that there have been at least 1,545 electric scooter accidents in the US between late 2017 and early 2019. Often, riders are under 18 or don’t have driver’s licenses. Many ride double, sometimes with small children (also not wearing helmets). Some scooter riders have suffered injuries from malfunctioning scooters or dangerous road conditions. Riders often ditch the scooters on sidewalks, bike paths, driveways, blocking business entrances, and other places where they pose hazards for pedestrians, bicyclists, and motor vehicles. There have also been reports of the scooters having been thrown at vehicles, breaking windshields, and causing property damage. 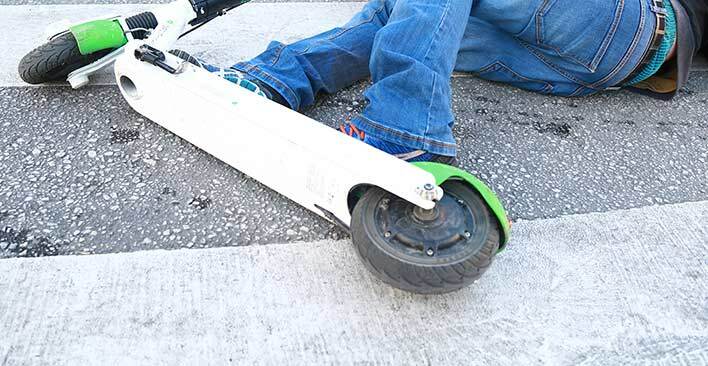 In many cities where e-scooters have mysteriously shown up overnight, officials are unprepared for complaints and injuries that occurred afterwards. Often, city regulations are inadequate to cover the impact of bleeding-edge technology. So, before jumping on an e-scooter, check the laws in your area to determine whether and where it is legal to ride it, and what regulations are in effect regarding helmet use and licensing. Visibility: E-scooters are small and less visible to motorists, because parked cars or other objects in the roadway may obstruct them from view. In addition, most motorists don’t consciously look for scooters at intersections or while turning. Lack of protection: Unlike occupants of cars and other enclosed vehicles, scooter riders have no barrier protecting them from the roadway, and lack safety devices such as airbags and seat belts. Although most laws require scooter riders to wear helmets, many don’t. 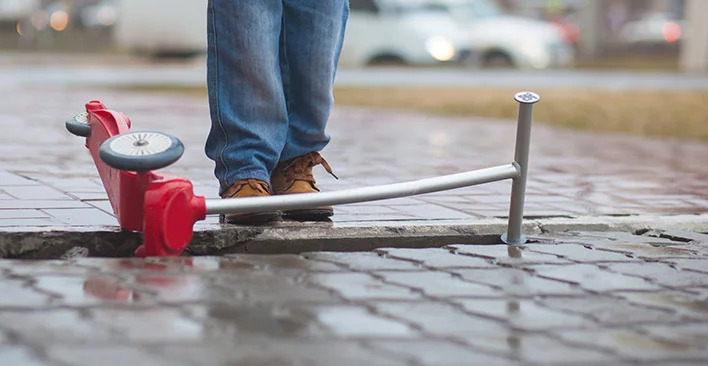 Dangerous roadways: Roadway defects such as uneven pavement, potholes, gravel, and debris could cause a motorized scooter to lose control, and fall or be thrown from the vehicle. Many scooter accidents occur when riders try to swerve around roadway defects or debris. Lack of stability: Scooters can lock up or become wobbly, especially when a rider suddenly swerves or applies the emergency brake. Lack of experience: Many scooter riders don’t have extensive experience, and struggle to operate a vehicle they have never ridden before. Reckless behavior: Some scooter riders operate the vehicles in a risky manner: not wearing helmets, riding at high speeds on sidewalks, operating a scooter with more than one passenger, or performing dangerous stunts. Driving under the influence: Unfortunately, it is common for riders to operate scooters while under the influence of alcohol or drugs. This is just as illegal as any other type of driving under the influence, and just as dangerous. A traumatic brain injury (TBI) occurs when a strong impact to the head damages the brain. Concussions are among the most common types of TBIs, and account for 40% of hospital visits due to electric scooter accidents. This may occur when an un-helmeted scooter rider takes a tumble or knocks a pedestrian to the ground, and the person’s head hits the pavement. Those who suffer brain injuries are at risk of permanent disabilities or even death. Even a mild concussion can result in permanent brain damage. However, the symptoms of a traumatic brain injury may not surface for days or even weeks after an injury. Symptoms of traumatic brain injury include neck pain, nausea, ringing in the ears, fatigue, and dizziness. 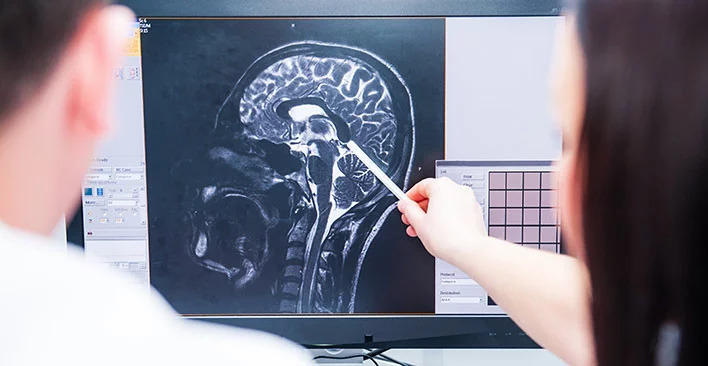 People with a severe brain injury may experience a persistent headache, vomiting, seizures, slurred speech, and inability to wake up after going to sleep. Traumatic brain injuries can impact thinking, language, speech, emotions, behavior, and functions of the senses. People who suffer these types of injuries often need extensive treatment and rehabilitation and may not be able to return to work. When scooter riders and struck pedestrians fall on their backs, they may suffer serious spinal cord injuries, including paralysis below the injury site, such as paraplegia or quadriplegia. The spinal cord is a bundle of nerves that runs down the middle of the back, carrying signals between the body and the brain. A spinal cord injury disrupts these signals. Such injuries might involve fractures or dislocations of the vertebrae, or damage to tissues and nerves. Treatments for spinal injuries may include surgery, medications, braces, or traction to stabilize the spine. Spinal cord injuries may require lengthy treatment and rehabilitation, and some people suffer significant chronic neck or back pain. Broken bones or fractures are some of the most common types of injuries suffered by electric scooter victims. Fractures can occur from falls, trauma, or a direct blow to a bone. After the broken bone heals, patients undergo physical therapy to regain function, mobility, and strength. These treatments are often expensive, and not always fully covered by health insurance plans. As a result, patients end up paying out of pocket for these costs. Broken bone injuries may also require that victims take time off work for an extended period, and this can result in lost income. Some types of broken bone injuries may result in permanent injuries or disfigurement, such as a limp. Those who suffer from fractures might also experience loss of function in the injured area. If you have been injured, seek prompt medical attention. If you are unable to stand, call 911 and allow paramedics to take you to the nearest emergency department. If you lost consciousness for any length of time, it is important to be examined for head injuries. Prompt medical attention will help you recover faster, and will also document of your injuries, and avoid gaps in treatment that could jeopardize your claim. Contact the police if the accident caused severe bodily injury or major property damage. If the police do not report to the scene, you should file a police report as soon as possible afterwards. If a scooter rider has struck you, get that individual’s name, contact information, and driver’s license number. Be sure to note the type of scooter the rider was on. If you are a scooter rider who has been struck by another vehicle, then you should also get the driver’s name, contact information, driver’s license, and insurance information. Gather as much evidence as possible from the scene. If possible, take photographs and video of the scene, including the vehicles, injured individuals, and the roadway. Get the contact information of anyone who might have witnessed what occurred. Contact a personal injury lawyer with experience handling cases involving scooter accidents. Who is Liable for a Scooter Accident? If you have suffered major injuries in an electric scooter accident, you probably wonder how to pay for your injuries and damages. While drivers of vehicles such as cars and SUVs must have liability insurance, electric scooter drivers have no such requirement. Automobile insurance generally does not cover scooter or bicycle rentals. At-fault rider: If the scooter rider was at fault, s/he can be held financially responsible for your injuries. If the rider has homeowner’s or renter’s insurance, that insurance company might cover your claim. Scooter company: We have seen many cases where e-scooters crashed because they were built with sub-standard parts or improperly maintained. These rental scooters have several different riders each day and may not be repaired directly after incurring damage. Defective or worn-out parts such as brakes may not be adequately repaired. If you have been injured as the result of a malfunctioning scooter, you may be able to file a claim against the scooter company. Product manufacturer: If an inherent defect, such as a manufacturing or design flaw, caused your accident and resulting injuries, you may be able to file a product liability claim against the scooter manufacturer to seek compensation for injuries and damages. At-fault motorist: If you are a scooter driver who has been struck by a negligent motorist, you can sue the at-fault driver for the injuries and damages caused. The driver’s auto insurance carrier should compensate you, particularly if the motorist’s negligence caused the accident and injuries. At-fault pedestrian: If a pedestrian causes a scooter rider’s injuries by stepping into the rider’s path, then the pedestrian’s homeowner’s or renter’s insurance might be able to compensate you for your injuries. Negligent business: Scooter riders often have difficulty maneuvering around debris and other dangerous conditions on the roadway. These dangerous conditions may occur because of a business discarding debris or trash outside. In such cases, the at-fault business or their insurance carrier may be liable for your injuries and damages. Government entity: If a dangerous roadway condition such as a pothole, uneven pavement or poor lighting has caused your scooter accident and resulting injuries, you may be able to seek compensation from the city or government entity responsible for maintaining the roadway. It is important to remember that the statute of limitations for claims against government entities is short, so you must file any such claim within six months of the injury date. Medical expenses: This includes emergency transportation (ambulance or helicopter), hospitalization, surgeries, cost of medication, medical equipment, doctor visits, prescriptions, and anything else related to the medical treatment for your injuries. Lost income: You may be unable to return to work because of the injuries caused by your accident, and may lose wages you would have otherwise earned. You can include these damages in your claim for compensation. Rehabilitation costs: Many types of common accident injuries extensive rehabilitative treatment such as physical therapy. Unfortunately, most health insurance policies have limited coverage for these treatments. These are additional damages you can recover. Lost future income: If you suffered catastrophic injuries such as brain injuries or paralysis from spinal damage, you may be able to seek recovery of lost future income and loss of earning capacity, which your injury lawyer will help you calculate. Pain and suffering: Categorized as non-economic damages, this includes compensation for the physical pain and emotional suffering endured by the victim. It is important to recognize that injury victims suffer emotionally as well as physically. Some may even develop post-traumatic stress disorder (PTSD). If you are unable to enjoy everyday activities such as playing with your kids, hiking, biking, or other hobbies, you can also seek compensation for loss of the ability to enjoy life. Electric scooter accidents are extremely complicated because the scooter rental business is a nascent, evolving industry, which is still trying to find its way. Our laws have not caught up with the rate at which this industry has been growing. An experienced accident injury lawyer can help you file or obtain a police report, determine how to pay for your medical expenses, compile evidence to strengthen your claim and maximize your settlement. TorkLaw has obtained millions of dollars in compensation for severely injured victims. We advance all costs, and you don’t pay any fees unless we recover compensation for you. We offer free consultations to victims and their families. If you were injured in an e-scooter accident, call us at 888.845.9696 to find out how we can help.